Meet us at the 33nd International Conference on Pharmacoepidemiology & Therapeutic Risk Management in Montreal, Canada. The PHARMO team will be present at the 33nd International Conference on Pharmacoepidemiology & Therapeutic Risk Management (ICPE) in Montreal, Canada, August 26-30, 2017. You are kindly invited to our booth (#35) to meet us. If you would like to arrange a meeting in advance, please contact us via pharmo@pharmo.nl. We are pleased to announce that 11 of our studies will be presented, in the fields of diabetes, oncology, cardiovascular diseases and women’s health and paediatrics. To see all our titles of posters, please click here. Unable to attend ICPE 2017 in Montreal? The abstracts and posters will be published on our website after the ICPE. Learn more about all PHARMO publications? Please click here. For more information about ICPE 2017 Montreal and to register, click here. We are pleased to announce that PHARMO contributed to a study which was presented at the world’s leading clinical conference on bone, joint and muscle health (WCO-IOF-ESCEO), in Florence, from March 23 to March 26, 2017. The study, entitled ‘Persistence with treatments for osteoporosis: a real-world study in the PHARMO Database Network’ was presented during the Poster Sessions. The aim of this retrospective observational cohort study was to describe persistence with treatments for osteoporosis in a real-world setting in the Netherlands. All patients with a prescription of daily or weekly oral alendronate, 6-monthly subcutaneous injection denosumab, intravenous (IV) or oral quarterly or weekly ibandronate, daily, weekly or monthly risedronate, raloxifene, teriparatide or yearly IV zoledronac acid were selected. To learn more about all PHARMO publications, please click here. Josine Kuiper, our oncology expert researcher, presented the first results of the Rx-pilot that provides insight into the use and outcomes of medicines in hospitals. Her presentation was held at the Dutch hospital pharmacy conference 2016. The pilot study was set-up at Jeroen Bosch Hospital and focused on the linkage of PHARMO’s in-patient pharmacy data to the Dutch Surgical Colorectal Audit (DSCA) from the Dutch Institute for Clinical Auditing (DICA). Patients who had undergone laparoscopy were compared to patients who had undergone open surgery for the treatment of colon or rectal cancer. The results of this study show that the majority of patients with colon or rectal cancer is treated using a laparoscopy. The most common used drugs during hospitalization were analgesics in both patients who had open or laparoscopy surgery, followed by anesthetics. In patients who had undergone open surgery, antibacterial medication was among the top 5 most dispensed medications during hospitalization. On the contrary, antibacterial medication was not in the top 5 most prescribed medication for patients who had a laparoscopy. Chemotherapy regimens were similar among both groups, the majority of patients received CapOx. With this study PHARMO and DICA will help hospital pharmacist to gain more insight into the use of medications in hospitals and whether patients are treated according to the Dutch guidelines. 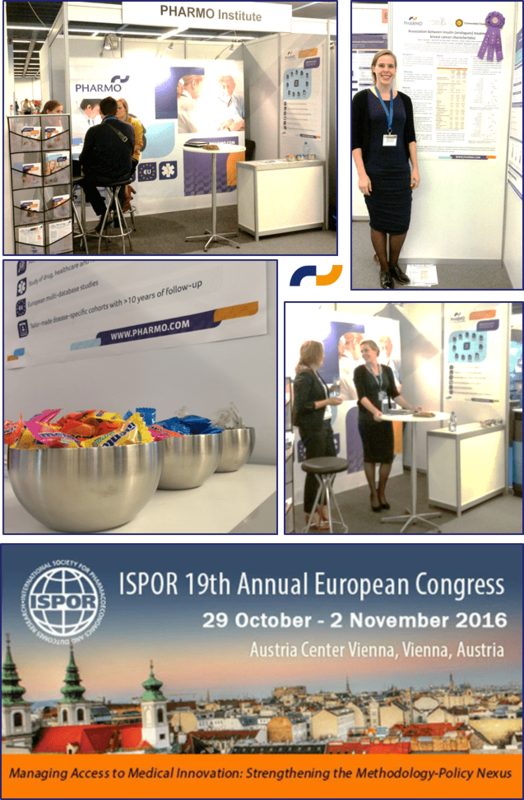 The PHARMO team had a great time at ISPOR Vienna! It was a pleasure to meet all the experts in the field, (re)connect with our clients and exchange ideas about the PHARMO Database Network and our expertise in outcomes and effectiveness research in Europe. At ISPOR we had the opportunity to (co)present several posters, which resulted in fruitful scientific discussions. We presented posters on the use of cyproterne/ethinylestradiol, the linkage with the Netherlands Perinatal Registry, utilisation of topical immunosuppressive treatments, the prevalence of severe asthma and the association between insulin treatment and breast cancer characteristics. For more information on our posters, click here! We enjoyed sharing our capabilities and our ideas about performing observational research during the meetings at the PHARMO booth. Did not get a chance to meet us in Vienna? Don’t hesitate to contact us for more information or to explore potential research projects. Edith Heintjes won the ‘Best in stream’ award with her presentation ‘Real-world evidence: a comparison between countries: common data models and SAS catalogs’ in the RWE stream at this year’s Pharmaceutical Users Software Exchange meeting. Her presentation outlined the PHARMO approach of using common data models and SAS catalogs in multi-country studies to ensure identical execution of analyses on site in each country. PHARMO was pleased to be able to contribute a second podium presentation to the RWE stream. Berber Snoeijer presented a model used to differentiate between COPD and asthma patients based on medication records only. The PhUSE meeting took place in Barcelona, Spain from 9th-12th of October 2016. During this year’s meeting, recurrent streams on topics relating to increasing speed and efficiency of processing clinical trials for a fast track to approval of drugs were supplemented with two new streams: Real World Evidence and Data Visualisation. Both presentations are backed by online papers. Please contact us to obtain these. Further details on the PhUSE annual conference 2016 can be found here. The PHARMO team had a great time at ICPE Dublin! It was good to meet all the experts in the field, (re)connect with our clients and exchange ideas about the PHARMO Database Network and our expertise in pharmacoepidemiology and drug outcomes research in Europe. At ICPE we had the opportunity to (co)present several posters and oral presentations, which resulted in fruitful scientific discussions. We enjoyed sharing our capabilities and our ideas on performing observational research during the meetings at the PHARMO booth. For more information on our presentations, click here! Did not get a chance to meet us in Dublin? 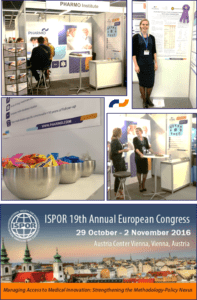 We are attending the ISPOR in Vienna, looking forward to meeting you there, or contact us. The ESPBC meeting took place in Gothenburg, Sweden from 26th-28th of May 2016. This meeting provided the international scientific community in the field of Spontaneous Preterm Birth the opportunity to exchange scientific information on the current knowledge and get updates on the latest findings. We are pleased to announce that PHARMO contributed to multiple studies in the field of preterm labour and outcomes, which were presented during the poster sessions of this meeting. In these studies long-term outcomes and healthcare resource use among children with and without preterm labour were compared as well as maternal safety outcomes and healthcare resource use among women who give preterm birth. Additionally, rates of postnatal outcomes were compared between children with and without the composite endpoint at birth, which is being used as a primary endpoint in ongoing Phase 3 RCTs to assess neonatal morbidity. To understand if the composite endpoint frequency was representative across different geographies, rates of this composite endpoint were compared between US and European settings. Please contact us to obtain the posters presented at the congress. Further details on the 2nd European Spontaneous Preterm Birth Congress can be found here. For more information about the linked PHARMO-PRN cohort, please click here. At the 84th European Atherosclerosis Congress in Inssbruck, the PHARMO study entitled ‘Clinical characteristics and LDL-cholesterol management in patients with cardiovascular event and/or diabetes in the Netherlands’ was presented during the Poster Sessions. The study describes a population of patients with cardiovascular disease or diabetes type II that might benefit from further LDL-C reductions to reach European targets. PHARMO was present at the international Diabetes and Cancer Research Consortium (DCRC). World-leading investigators at the forefront of research on the overlap between cancer and type 2 diabetes attended a packed 2-day programme (25th and 26th April). Myrthe van Herk-Sukel, who is Manager Research Department at the PHARMO Institute, presented “Key papers in field since last workshop“, discussing the latest developments in the field. Also, the PHARMO study entitled “Association between insulin treatment and breast cancer characteristics” was presented by Jetty Overbeek, Research Manager at the PHARMO Institute. Formed in 2010 the DCRC was established following a mandate from the European Association for the Study of Diabetes (EASD). The EASD appointed a task-force of leading researchers in response to a series of controversial papers published in 2009, that linked a commonly prescribed treatment for type 2 diabetes mellitus with an increased risk of cancer; bridging the two traditionally separate disease areas. The task force set up the DCRC as part of a wider package of measures that sought to respond to this emerging field of research. The DCRC is an international consortium of investigators undertaking pharmaco-epidemiological studies with aims to optimise methodologies addressing the diabetes-cancer questions and to (meta)-analyse data derived from different databases where possible.